ATAC Summarizes Barrick’s Success… | ATAC Resources Ltd.
January 17, 2018 - Vancouver, BC - ATAC Resources Ltd. (TSX-V:ATC) (“ATAC”) is pleased to announce a summary of the comprehensive 2017 exploration program on the Orion Project, located within the Rackla Gold Property, Yukon. The Orion Project comprises the central portion of ATAC’s Rackla Gold Property and is subject to a $55 million earn-in agreement with Barrick Gold Corporation (“Barrick”) (see ATAC news release dated April 10, 2017). As part of the earn-in requirements, Barrick must spend $10 million on exploration at the Orion Project by December 31, 2019. Expenditures by Barrick in 2017 were ~$4 million. Ground based gravity survey and Lidar terrain mapping. A substantial component of the 2017 exploration program was the initiation of both regional-scale and target delineation geological mapping. The mapping teams, made up of Barrick and ATAC geologists, systematically mapped approximately 300 km² of the eastern section of the Orion Project area between June and September 2017. The mapping resulted in a detailed classification of the Paleozoic stratigraphy and a refined understanding of the complex structural environment. The resulting data will be used to target favourable host rocks during future drill campaigns. An updated Orion Project map can be found on ATAC’s website. several debris flow packages and turbidite sequences identified in holes two, three and four confirming important slope facies environments exist throughout the Paleozoic sequence at Orion. Thirty-two holes totalling 1,532 m were completed on the Orion Project in 2017. The RAB drilling tested the stratigraphy, alteration and the mineralizing potential of bedrock within overburden covered areas. The Pyramid target area was a particular focus of the RAB drilling as little was known about the geological environment as it is located in an area of low relief and significant surface cover. An extensive rock, soil and stream sediment sampling program was undertaken in 2017. This sampling program expanded coverage over known Paleozoic stratigraphy that had not previously been assessed. As part of the program, representative samples were collected for the purposes of geochemical classification of lithology and the identification of alteration suites. This data will be compiled into the existing database to assist in the overall understanding of the geologic setting and gold potential of the district. A ~50 km² ground-based gravity survey was conducted between the Anubis and Pyramid target areas. The gravity survey was performed to assist in the identification of structures and characterization of rocks within covered terrain. A fixed-wing based Lidar survey was also conducted to provide better ground control and to improve the identification of geologic contacts and structures below treeline. Preliminary interpretation of results from the gravity survey indicate good consistency with the regionally mapped geologic units while posing some alternative structural geometries of buried units within the Anubis Fault corridor. 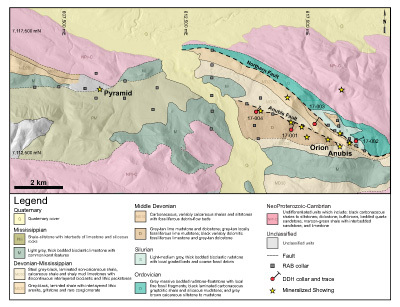 Prior to Barrick’s involvement on the Orion Project, ATAC discovered Carlin-type gold mineralization at the Anubis Zone in 2012 through follow-up of an 18 km² arsenic-in-soil anomaly. Between 2012 and 2016 ATAC completed ~5,000 m of diamond drilling within the Anubis Cluster and highlights include 8.51 m of 19.85 g/t gold from the Anubis Zone and 61.29 m of 2.75 g/t gold from the Orion Zone. Nine other prospecting discoveries within the Anubis Cluster (Ana, Corona, Columba, Dale, Dorado, Draco, Hydra, Lyra and Zodiac) have received only cursory follow-up since their discovery in 2012.